Your opinions are assertions! My opinions are science! What had the drinks companies being doing, I wondered. Denying the link between drinking and liver cirrhosis? Disputing the number of drink-driving fatalities? Intrigued, I looked up the study in question, which was by some Australian academics, and found myself reading one of the weirdest things I have seen in a journal for some time. Kypri is one of the many psychologists who are now on the 'public health' gravy train. Three of his four co-authors are also psychologists (I can't work out what the other one is) and they are united in a near-religious belief in the cause of lifestyle regulation. Theirs is way, the truth and the life. Anybody who disagrees with them is a liar, a deceiver and deserves to be cast out of decent society. Their paper, published by PLos One and known hereafter as Martino et al., is loosely based on a 'systematic review' (which was nothing of the sort) by the thick-as-mince quackademic Anna Gilmore and her chums in 2014 which looked at tobacco industry lobbying. Gilmore's paper (Savell et al. 2014) shockingly revealed that tobacco tactics included such dirty tricks as trying to persuade politicians that 'the proposed policy will have negative unintended consequences, that there are legal barriers to regulation, and that the regulation is unnecessary'. In other words, they make the kind of arguments that any industry - or group of individuals - would make if the government was pursuing a vendetta against them. It is lobbying, and shouldn't come as a surprise to people in 'public health' who spend half their lives complaining about industries lobbying (they spend the other half, er, lobbying). Martino et al. 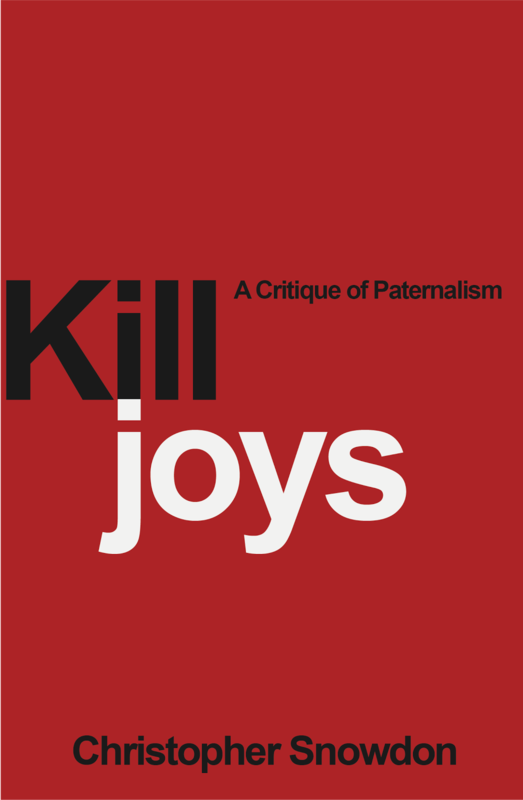 are critical of Savell et al. for being too soft on Big Business. For them, any opinion that conflicts with 'public health' dogma is beneath contempt and, they say, should not even be dignified with the word 'argument'. While Savell et al. use the term ‘arguments’ to refer to assertions or claims made by the tobacco industry in support of its position in favour of or against particular policies, we suggest a more suitable label. 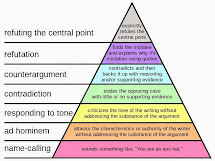 The word ‘argument’ is generally understood to refer to a connected series of propositions intended to establish a conclusion . The validity of the conclusion depends on the veracity of the propositions and the soundness of the logic linking them. In our view, by using the term ‘argument’, Savell et al. elevate what are, almost without exception merely claims or assertions, to a status they do not deserve. Accordingly, we use the terms ‘claim’ and ‘assertion’ interchangeably in our analysis reflecting the class ‘argument’ in Savell et al.’s system. After this Stalinist statement of intent, Martino et al. explain their assumptions. Sort of. We started with the assumption to usis [sic] the reader meant to make of this? er, [sic!] cite evidence to support the claim. [sic!] should be made.n [sic!] of participants are likely to that corporations’ framing of alcohol problems, scientific evidence, and government policies, is part of a strategy to influence policies in ways likely to protect or generate profit. If so, their starting assumption is also their conclusion. Everything in between is padding. Viva academia. The alcohol industry claims its marketing targets only adults, however, research shows that young people are also exposed to this marketing and are negatively affected by it [1, 2]. If the industry genuinely wishes to target only adults, the self-regulatory codes should include restrictions on sport sponsorship, outdoor media and product placement in films and music videos. This is a misreading of what 'targeting' means. One would target children by advertising during children's TV programmes or using children's cartoon characters. Martino et al. portray any advertising that is seen by children as being targeted at them, whereas the target market for a beer commercial shown during a cricket match, for example, is adult males, who make up the bulk of the audience and, not coincidentally, the bulk of the beer market. Martino et al. are not actually complaining about alcohol adverts being targeted at children. They are complaining about children ever seeing alcohol adverts at all, or even just seeing alcohol ('product placement in films'). The alcohol industry repeats the mantras that ‘most people drink responsibly’ and that alcohol consumption can be ‘part of a healthy lifestyle’ , claiming then that the majority of the population should therefore not be ‘punished for the sins of the few’ through policies that reduce the promotion of alcohol . The first two points are demonstrably true and the third point is a reasonable, mainstream opinion derived from those facts. It was claimed within industry submissions that there was insufficient evidence to link marketing of alcohol products to increased alcohol consumption, and therefore, that marketing regulation would have no effect (eg #10). Some specifically stated that more research would be needed to prove this link. There is a lack of robust evidence for or against recommending the implementation of alcohol advertising restrictions. Awkward. Remember that this is what the Guardian describes as industry 'subverting science'. 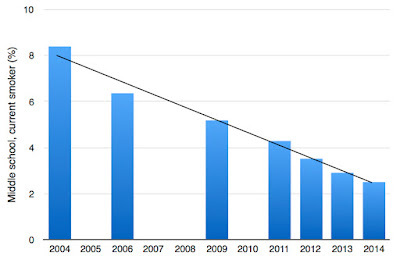 Submissions cited Australian government research purporting to show a decline in alcohol consumption in minors and pregnant women  and claiming “…there is no evidence to suggest that alcohol problems are on the rise which could justify further regulatory constraints on the alcohol industry” (Brewers Association of Australia and New Zealand (BAANZ)). I don't know why the word 'purporting' is in there. 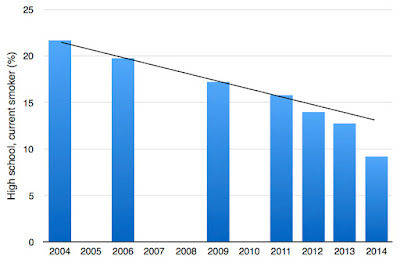 They cite the government research which does indeed show a decline in alcohol consumption. Perhaps Martino et al. do not trust official statistics either? In any case, the claim is correct, as is the claim about the lack of evidence that alcohol problems were on the rise in Australia at that time. Like the tobacco industry, the alcohol industry proposed that there is insufficient evidence to show that marketing influences consumption, asserting that it merely affects brand loyalty. This is true, regardless of what single issue campaigners want to believe. It is true of all established products. If industries could grow the market by advertising, they would spend far more on advertising than they do. Some asserted that alcohol production provides substantial economic benefit and employment within Australia, and that increased marketing regulation would adversely affect the economy. Alcohol production clearly provides employment. It also provides economic benefit by any conventional economic analysis. Whether marketing restrictions would adversely affect the economy is somewhat contestable but given the benefits advertising brings in terms of lowering search costs and generating competition, this claim is highly likely to be true as well. Martino et al. try to brush off the economic benefits by quoting a ludicrously high estimate of the cost of alcohol to society but, as have been explained umpteen times - most recently in a report from Menzies House - such estimates are not monetary costs, are not external costs and cannot be compared to the economic benefits associated with alcohol. Biased public health advocates was a newly identified type of claim within the Insufficient Evidence frame. Submissions asserted that the Expert Committee on Alcohol, with whom ANPHA consulted to develop this report, was biased and anti-alcohol and that the research referenced in the report was not scientifically valid (eg #13). For example: “Lion believes that ANPHA should be careful to distinguish between research that is the best available, expert, peer-reviewed research and surveys that are produced by anti-alcohol activists…” (Lion). One only needs to read Martino et al. 's study to find evidence of biased public health advocates. It is a bit rich to complain about ad hominem attacks from your opponents when your entire 'study' starts from the premise that your opponents are inherently dishonest. Attacking the credibility of public health advocates in submissions to government appears to be increasing . Their evidence that this 'appears to be increasing' (reference 58) is a study that was written 15 years ago. A set of claims was also framed around the notion that increased regulation has negative unintended consequences. The key themes were: 1) manufacturers, who would, as consequence of regulation, have trouble maintaining or increasing market share (eg #14), or have difficulties introducing new brands (eg #15); 2) employment in associated industries (eg #16a, b); 3) loss of public revenue from alcohol tax and the alcohol industry’s direct contribution to the Australian economy (eg #17); and 4) loss of consumer sovereignty (eg #18). It is a rare policy that doesn't have some unintended consequences, but this can never be admitted in 'public health' because it is a cult that sees itself as infallible and must portray every regulation as a win-win. In this instance, it is blindingly obvious that advertising bans make it more difficult for companies to fight for market share and launch new brands; only a moron who doesn't have any understanding of advertising whatsoever could fail to see that. Banning a major industry from advertising is also likely to lead to unemployment in the advertising industry. That, too, should be obvious. The only dodgy part of the claims cited in this paragraph is the idea that the government will lose revenue from alcohol taxes if advertising is banned. This implies that the industry expects the market to shrink if advertising is banned, but if you look at the source (#17) you can see that the Brewers Association is not saying this at all, it is merely reminding people that it contributes to the economy. The source they cite doesn't even mention advertising. Martino et al. are playing fast and loose with the facts again. Two claims were identified within the Legal frame. Some submissions asserted the need for a Regulatory Impact Statement before proposing new regulation, for example “…any proposals to further regulate alcohol advertising needs to clearly demonstrate that the social and economic cost it potentially introduces are outweighed by the benefits in an environment where rates of “at risk” consumption and harm are either stable or in decline.” (#20, Winemaker’s Federation of Australia). If it is a devious industry trick to ask for evidence that the benefits of a policy will outweigh its costs, I hope more politicians fall for devious industry tricks. Seems like good law-making to me. Some submitters claimed they were ‘socially responsible companies’ by presenting involvement in efforts and programs to reduce harmful consumption. For instance, “Recent examples of our social responsibility initiatives include…a social marketing campaign, using the strapline ‘Don’t see a good night wasted’, aimed at 18–25 year olds socializing in and around licensed venues in Sydney.” (#22; Diageo). Some emphasised their membership of DrinkWise (eg #23a; an industry funded ‘social aspects/public relations’ organization (SAPRO)), as evidence of their commitment to Corporate Social Responsibility . For example, Lion stated that it “…is committed to…funding culture change initiatives, such as those developed by DrinkWise…”. This isn't an argument at all and insofar as it is a claim, it is true. I suppose the companies are showing their credentials and trying to make a good impression, as most people would if they were dealing with a powerful government. Alcohol industry actors used multiple strategies to push their claims that increased marketing regulation in Australia is unnecessary, including claims that: there is ‘insufficient evidence for the effectiveness of increased regulation’; ‘there is insufficient evidence that alcohol marketing contributes to drinking’; ‘current regulation is satisfactory’; ‘there is no community concern’; and that ‘the alcohol industry markets its products in a way that minimise harmful consumption’. The five statements are, in order, (1) True, (2) True, (3) Matter of opinion, (4) Depends on circumstances, (5) Matter of opinion. These assertions, at least regarding health, stand in contrast to the scientific literature regarding alcohol-related harm and continuing high levels of alcohol consumption in the community. The science reveals the poverty of industry claims that industry actors put to public servants whose job it is to evaluate submissions... Continuing to engage with industry as stakeholders in public health policies increases their opportunities to present such claims. Or, put bluntly: "Ban them from lobbying and listen only to us." And that is your evidence, from a peer-reviewed journal, no less, that the alcohol industry is 'subverting science' (The Guardian). I don't know whether to laugh or cry. We recorded a new Spiked Last Orders podcast last week, with John O'Connell (Taxpayers' Alliance) as our special guest. We discussed the annual glut of post-Christmas nagging from the pretend public health lobby, as well as the roast potato scare and Public Health England's alcohol review. As ever, you can subscribe to the podcast on iTiunes or listen online here. It’s enough to make Jared Brown spill his drink. The co-founder and master distiller behind Sipsmith, the micro-distillery in the vanguard of the craft gin movement in the UK, is contemplating the possibility of graphic warning photographs and plain packaging appearing on bottles of alcohol, akin to the restrictions on tobacco that assume full force in May. They can't say we didn't warn them. In December, a report from the government advisory body Public Health England suggested that bottles of alcohol could be sold in plain packaging and carry larger health warnings, including photographic warning labels. This month, public health groups called for a ban on all alcohol advertising in the UK and a study published last week by the University of Liverpool recommended placing warning labels on the front of bottles and using plain packaging to emphasise the risks associated with excessive drinking. The study from Liverpool didn't get much attention from the media, but it is worth examining to see how the same pseudo-science is being used in Phase Two of the plain packaging crusade as was used against tobacco in Phase One. It was produced by two researchers at the junk science factory of the UK Centre for Tobacco Studies which is now known as the UK Centre for Tobacco and Alcohol Studies (hello, slippery slope). They showed photos of alcohol labels to sixty people from Liverpool University and used eye-tracking technology to monitor how long they looked at the health warnings. Each photo was shown for 15 seconds and each person spent an average of one second per photo looking at the warning. In study 1, we demonstrated that self-reported motivation to reduce drinking reduced attention to both branding and warning labels on alcohol packaging. Although we did not replicate this association in study 2, we did demonstrate that a brief alcohol intervention reduced attention to branding, although this effect was not specific for alcohol packaging and the brief alcohol intervention did not influence participants’ motivation to reduce drinking. Contrary to hypotheses, our experimental manipulation that encouraged participants to focus their attention on warning labels did not affect their drinking intentions for the subsequent week. In other words, neither the brief intervention nor greater attention to warnings led people to express a desire to reduce their drinking. Having failed to prove their hypothesis, the authors carry on regardless with their push for graphic warnings and plain packaging. This, of course, was the whole point of doing the experiment. A possible explanation [for the experiment being a flop] is that participants do not particularly notice warning labels, due to their current design [14, 32]. Our results show that alcohol warning labels on average take up less than 5% of the packaging and that attention to warning labels is roughly proportional to their size. Additionally, our results suggest that large alcohol warning labels attracted more attention, but we did not experimentally test this. Indeed, some researchers argue that alcohol warning labels should be more like tobacco warnings and nutrition labels and provide clear information about alcohol-related risks and unambiguous behavioural recommendations in order to increase their effectiveness [37, 38]. This suggests that alcohol warning labels might need to elicit negative emotions in order to reduce consumption. 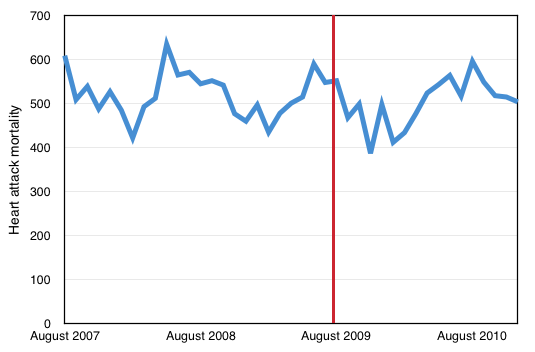 Future research should explore the effect of label design and content on attention. Increasing the visual salience of warning labels by using plain packaging [9, 10], graphic warnings  and front-of-pack labelling  might be more effective in attracting and maintaining attention, as shown in tobacco and food research. And relax. None of these conclusions are derived from their data. They had to resort to speculation based on other people's research, but they got to their preordained conclusion in the end. The results showed that people paid minimal attention to warning labels on alcohol packaging (7–8% of total viewing time). Alcohol consumers allocate minimal attention to warning labels on alcohol packaging and even if their attention is directed to these warning labels, this has no impact on their drinking intentions. If one second is 'minimal attention', how long should we expect people to look at the warning? As the authors admit in an endnote, the health advice is not really a 'warning' at all. It just says 'drink responsibly'. In previous literature, these types of “drink responsibly” labels have been referred to as “warning labels” or “health warnings” . For the sake of consistency, we will refer to the drinkaware labels as health warning labels in this manuscript. The words 'drink responsibly' can easily be read in less than a second, particularly since it is the same message on every label. The only other health messages that typically appear on alcohol packaging in the UK are the image telling pregnant women not to drink and the Chief Medical Officer's recommendations about safe drinking, both of which are always the same and will be familiar to any drinker. It is important to understand that the participants in this experiment were (falsely) told that they were taking part in a memory test and they were given a bogus memory test after the real experiment had been conducted. Naturally, therefore, people spent more time studying the packaging (which was different every time) than the 'warning'. The study conspicuously failed to show any relationship between time spent looking at the warning and intention to reduce drinking ('exposure did not significantly affect drinking intentions'), but that does not stop the authors from concluding that policies should be introduced to make people spend more time looking at warnings. No matter what findings had resulted from the experiment, the authors would have called for bigger, bolder health warnings, preferably accompanied by plain packaging. Heads they win, tails you lose. But even if the experiment had shown what the authors clearly wanted it to show, it would not support the introduction of graphic warnings or plain packaging. Warning labels are supposed to be educational. The only criterion of success should be whether the individual understands and remembers the information, but the authors do not attempt to measure this. Instead, they look for evidence that individuals respond to information by expressing a desire to drink less. This is not a legitimate goal. Aside from the fact that people's stated preferences are frequently at odds with their revealed preferences, there is no reason to assume that every individual needs to reduce their drinking, even from a health perspective. The implicit assumption in this study is that health information only works if it deters consumption. This is false. The information in these so-called warnings is 'drink responsibly'. The authors did not bother to ask the participants if they recalled that message (or, if they did, the authors don't mention it in the study). That should have been the primary question. A secondary question could have been whether the participants thought they drank responsibly, or whether they were more likely to agree that people should drink responsibly after seeing the labels, but the authors do not ask that question either. The implicit assumption is that drinking responsibly means drinking less, but this is also false. Expect much more of this junk in the next couple of years. The floodgates are opening. Many readers will be familiar with the illiberal, harmful and scientifically illiterate EU ban on snus. To the UK's eternal shame, it was a British moral panic that got the ball rolling in the 1980s and the EU has been too pig-headed to correct its error in the years since. Brexit offers the UK hope of sane harm reduction strategy in which snus is relegalised, but there is no guarantee that politicians will see the opportunity and, even they do, it will not help the rest of the EU. 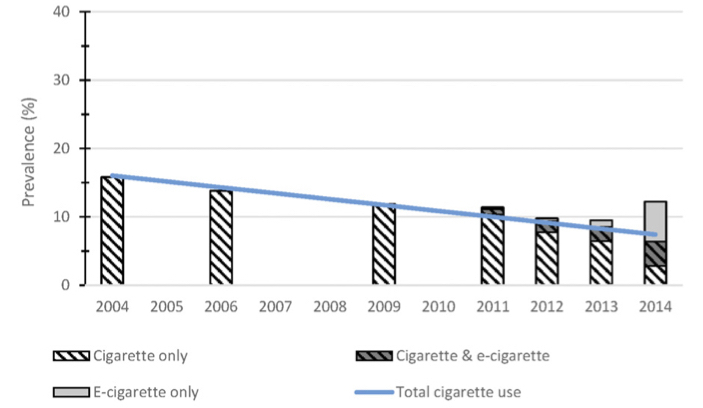 'The advent of e-cigarettes did not affect declining trends in ... current (use in past 30 days; bottom panel) cigarette use'. Glantz and Dutra do not define how old these 'adolescents' are, but they cite the National Youth Tobacco Survey as their source. 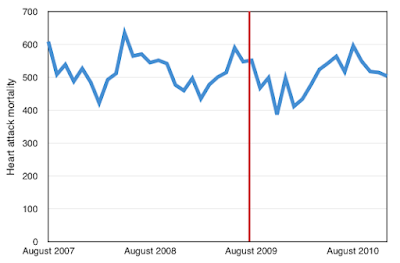 The NYTS data can be downloaded here if you have Microsoft Access or can be viewed individually here: 2004, 2006-09, 2011-12, 2013 and 2014. 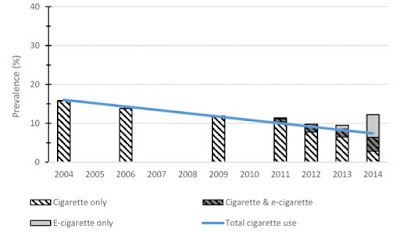 Glantz and Dutra base their pre-vaping trend on 2004 to 2009 which is problematic because almost nobody was vaping in 2009, let alone teenagers. Even in 2011, the past month vaping rate in high schools was only 1.5%. The big rise in e-cigarette use occurred between 2012 and 2014 when past month e-cigarette use rose from 2.8% to 13.4%. That is a relatively minor issue, however. The bigger issue is that Glantz and Dutra's graph doesn't bear much resemblance to the NYTS data. They claim that 'Current smoking decreased from 15.8 per cent in 2004 to 6.4% in 2014' but the only reference Google can find to a smoking rate of 6.4% in 2014 comes from their own study. The NYTS shows a cigarette smoking rate of 9.2% among high school students and a rate of 2.5% among middle school students. I can't see any way of crunching the numbers to arrive at the figures Glantz and Dutra use, so let's look at what the NYTS actually shows. 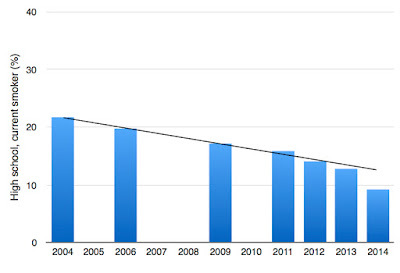 If we look at the proportion of middle school students who have smoked a cigarette in the past 30 days (ie. current smokers), the rate falls at the kind of steady pace that might be expected if we assume a linear decline (which cannot, in fact, be assumed). 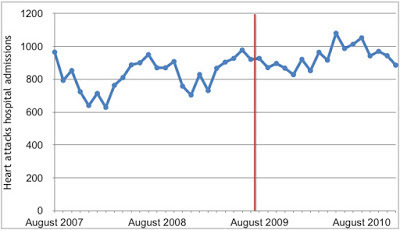 The black line shows the 2004-09 trend extrapolated forward, as per Glantz and Dutra. 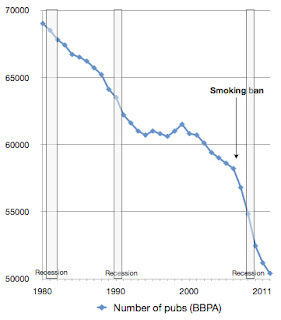 All the smoking rates since 2011 are lower than the pre-2009 trend would have predicted and the rate in 2014 is dramatically lower. If Glantz and Dutra 'didn’t find any evidence that e-cigarettes are causing youth smoking to decline', they can't have been looking very hard. Both the National Youth Tobacco Surveys and the Monitoring the Future surveys show an unusually large decline in smoking rates in recent years. These surveys cannot prove causation but they provide pretty good prima facie evidence that e-cigarettes have indeed caused youth smoking to decline - and they certainly disprove Glantz and Dutra's claim that the 'decline in current smoking ... did not change after the introduction of e-cigarettes'. If the decline in smoking had continued at the pre-2009 rate, the high school smoking rate would have been 14% in 2014. Instead it was 9.2% - a third lower than Glantz's little model would have predicted. 'Creating a brand new generation of cigarette smokers' and 'expanding the tobacco market', my arse. Scoundrels. If you're in Britain you've probably read about the great roast potato scare today. I've written about it for Spectator Health. You can also listen to me talking about it on Talk Radio with Julia Hartley-Brewer. And David Spieglhalter has written a good piece about the science here. A new IEA report today looks at the cost of obesity to the taxpayer. This is variously claimed to be £6 billion or £16 billion. When I was on the radio last year, Tam Fry from the National Obesity Forum claimed it was £25 billion per year. These figures are all wrong, but while the £16 billion and £25 billion are totally fraudulent, the £6 billion figure is merely grossly misleading. It is wrong within normal parameters. When looking at costs to the taxpayer, what matters is the net cost, not the gross cost. The £6 billion figure is based on the gross cost, which is to say that it assumes that if people didn't die from obesity-related diseases they wouldn't die at all (or, at least, would die of a disease that costs no money to treat). This leads to a greatly exaggerated estimate of the financial consequences for the government. Surprisingly (or not), no one has bothered to estimate the net cost of obesity to public services. Until now. Economist Mark Tovey has now provided that service and Obesity and the Public Purse is the result. He does not challenge the gross cost estimates cited by 'public health', nor does he challenge the assumptions made about the health effects of being obese (and overweight) - although there are reasons to do both. Instead, he takes these figures as fact and works out the savings associated with obesity in terms of uncollected pensions, healthcare, social care etc. and calculates that the total net cost is no more than £2.5 billion per annum - and may be considerably less. This is not a trivial sum of money but it is only 0.3 per cent of government spending. It is not going to bankrupt the NHS. “Given the NHS is currently in the icy grip of a winter-related spike in demand, the topic of healthcare costs could not be more pertinent. Every year, the public price of increased longevity is brought into focus as the cold weather drives a growing number of frail pensioners en masse into ailing A&E departments around the country. The Institute of Alcohol Studies (née the UK Temperance Alliance, ne´e the UK Alliance for the Suppression of the Traffic in all Intoxicating Liquors) complained to the Independent Press Standards Organisation about a story in The Times last year headlined 'Anti-drink lobby drew up official safety limits'. If you've read my article about the guideline group's internal documents, you will know that this is perfectly true. Four of the members of the guideline development group were affiliated with the Institute of Alcohol Studies (Linda Bauld, Gerard Hastings, Katherine Brown and Petra Meier). several others have a strong bias against alcohol and/or the alcohol industry, such as Ian Gilmore of the Alcohol Health Alliance. It is appropriate to describe these people as part of the anti-drink lobby and it is correct to call the IAS a temperance group. The IAS was created by the Alliance House Foundation, which is an offshoot of the 19th century prohibitionist organisation the UK Alliance for the Suppression of the Traffic in all Intoxicating Liquors. One of the Alliance House Foundation's stated objectives is ‘to spread the principles of total abstinence from alcoholic drinks’. In 2015/16, IAS got £392,000 of its £401,713 income from the Alliance House Foundation, with the remainder coming from the National United Temperance Council and (surprise, surprise) the European Commission. It is 99.5 per cent funded by temperance groups who preach the doctrine of total abstinence. The complainant said that it was inaccurate of the headline to report that an anti-drink lobby drew up official safety limits, and that the headline was not supported by the text of the article. She said that the decision to lower the limits set out in the guidelines was made by the four chief medical officers for the UK nations, who were advised by the GDG [guideline development group]. She said that no members of the GDG were “anti-alcohol lobbyists”, nor do they have any links to “anti-alcohol organisations”. The complainant said that the IAS was not an anti-alcohol organisation, and it did not have a view on whether individuals should drink or not drink. She also said that the IAS does not “seek to eradicate alcohol”, and that it had never published any work promoting total abstinence from alcohol, and does not share the aim of its funding body in promoting total abstinence. In any event, she said Ms Meier and Mr Hastings, while members of the GDG, were expert advisors to the IAS, not members of the organisation. She said that she had been a member of the BEG, responsible for reviewing the old drinking guidelines, not the GDG, and that Ms Bauld was a trustee of IAS, but not a member of the GDG. The complainant also disputed the views expressed by the publication’s source on the influence of the “anti-alcohol lobby” on the GDG’s workings; she provided a statement from the co-chair of the GDG supporting her view. 10. While the article had reported that four figures involved in drawing up the guidelines were “members” of the IAS, it went on explain each of the four’s precise relationship with the organisation. While the Committee welcomed the clarification published in the newspaper, as well as online, it did not consider that it was significantly misleading to refer to the four as “members” of the IAS in light of their links with the organisation. There was no breach of Clause 1. 11. The Committee acknowledged the complainant’s position that the IAS did not seek to eradicate alcohol. However, the article had made clear its basis for the characterisation of the IAS as an anti-alcohol organisation: details were provided of its relationship with AHF, and the newspaper’s source had provided its view on the influence they had on the GDG’s work. The Committee wished to make clear that it was not making a judgement on whether the IAS was anti-alcohol; rather, it had to decide whether the newspaper had provided sufficient evidence to support this characterisation. Overall, given the information of its relationship with the AHF outlined in the article, the Committee considered that the newspaper had provided a sufficient basis to support its characterisation; there was no breach of Clause 1. 12. While the headline reported that the “anti-drink lobby” had drawn up the official safety limits, the article’s first-line referred to the “panel of experts that helped reduce” the limits, and went on to make clear that their report was provided to Britain’s chief medical officers, who “announced the new limit in January”. In circumstances where it was not in dispute that the GDG’s report had advised the chief medical officers to reduce the limits, and the article reported that the final decision was made by the chief medical officers, it was not misleading for the headline to say that the “anti-drink lobby” – the basis for which the publication had explained – had drawn up the limits; this headline had also been supported by the text of the article. There was no breach of Clause 1. 13. The complainant disputed the view of the newspaper’s source about the influence IAS members had on the GDG, and provided an alternative view from the chairman of the panel. In circumstances where the views expressed had been clearly presented in the article as the opinion of the source, and this source had “close knowledge” of the meetings that had taken place over a period of years, there was no breach of Clause 1. Back in 2009, the BBC's Mark Easton tried to spin the mass closure of pubs in the wake of the smoking ban with an article titled 'Pubs aren't dying - they are evolving'. And so they were - evolving into flats, coffee shops and derelict ruins. Britain has seen the biggest collapse in pub numbers for a century since it went 'smoke-free', but this can never be admitted by the BBC. Easton blamed 'publicans who are unable or unwilling to adapt to the 21st Century trading environment'. This is a common refrain from apologists for the ban. They portray landlords as being at fault for not turning their pubs into sandwich bars, crèches and community centres when all their customers really want is to drink, smoke and socialise. 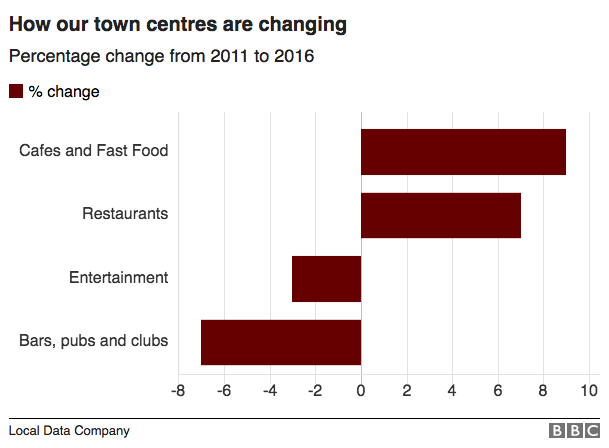 Today, the BBC has published a story about the decline of town centre pubs which, as usual, ignores the elephant in the room. "The traditional snooker club, which the sport had in the 1970s and 80s, is not working now but there are many that are thriving. The snooker clubs that are closing down are probably not inviting; there's a little doorway on a street where people don't go in." “The grass-roots and amateur scene has almost disappeared, it started when the tobacco ban came in and clubs started folding." 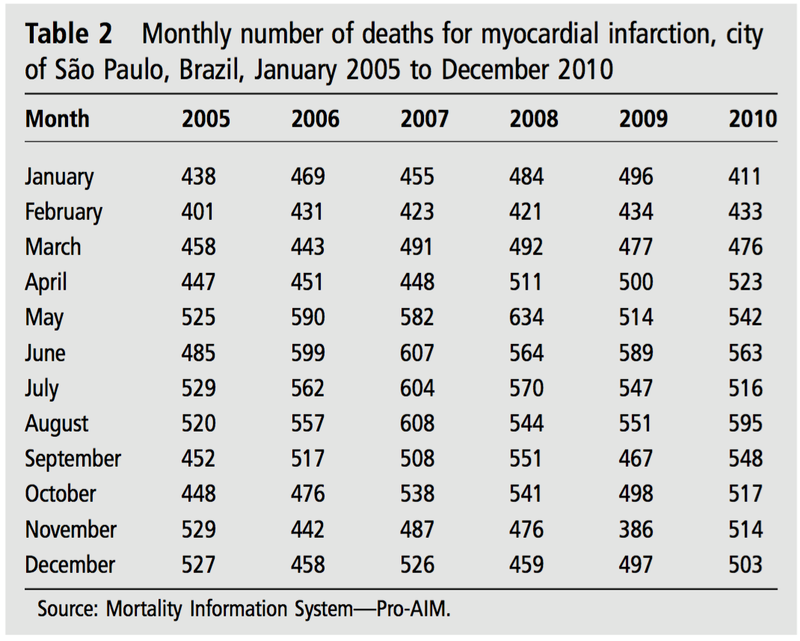 Last month I wrote about the claim in Tobacco Control magazine that a smoking ban in Sao Paulo, Brazil had reduced the heart attack rate. Using the figures provided by the study's authors, I showed that the supposed decline was not obvious to the naked eye, to say the least. We observed a reduction in mortality rate (−11.9% in the first 17 months after the law) and in hospital admission rate (−5.4% in the first 3 months after the law) for myocardial infarction after the implementation of the smoking ban law. As usual in 'public health', the claim that something was 'observed' actually means that the data were fed into a model to produce the desired outcome, but what devilish model could have produced such a counter-intuitive conclusion? The authors say that only three variables were fed into the model: carbon monoxide levels, temperature and humidity. 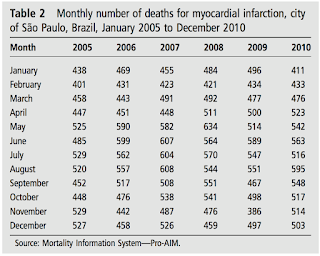 RESULTS: We observed a substantial increase in mortality and hospital admissions for myocardial infarction after the implementation of the smoking ban law in Sao Paulo in August 2009. However, it is possible that other factors are responsible for this increase. 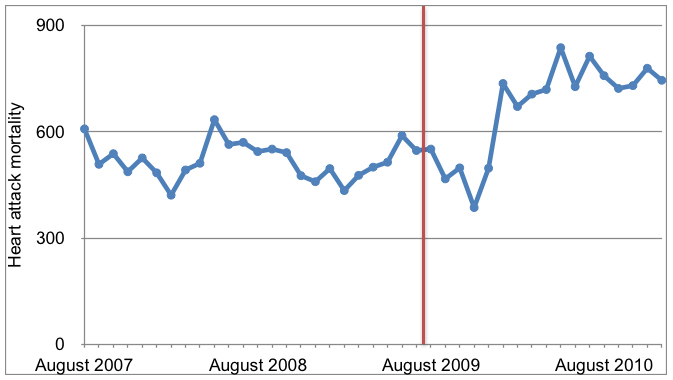 After hand-picking a small number of possible confounding variables, and applying opaque statistical adjustments to account for their effect though without providing the data necessary for verification, we have been able to demonstrate that these increases could represent a modelled reduction in mortality attributable the smoking ban (−11.9% in the first 17 months after the law) and in hospital admission rate (−5.4% in the first 3 months after the law). Last week, one of the authors responded with a partial explanation: incompetence. Correction notice This article has been corrected since it was published Online First. The values in the final column of Table 2 have been updated. 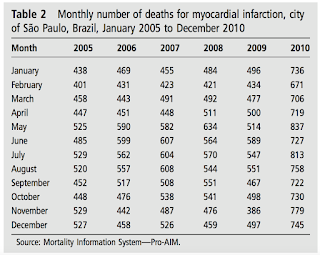 Data concerning monthly number of deaths for myocardial infarction was provided by Health Ministry through Mortality Information System and DATASUS. During the registration of information in table 2, the last column mistakenly recorded the sum of the number of stroke deaths with the number of stroke and infarction added, that is, unreal numbers. The correct numbers are now shown. The information can be obtained in http://tabnet.datasus.gov.br/cgi/tabcgi.exe?sim/cnv/obt10SP.def. This information will not interfere with the rest of the analysis, because the analysis was done will the original data of deaths, not based in this table. 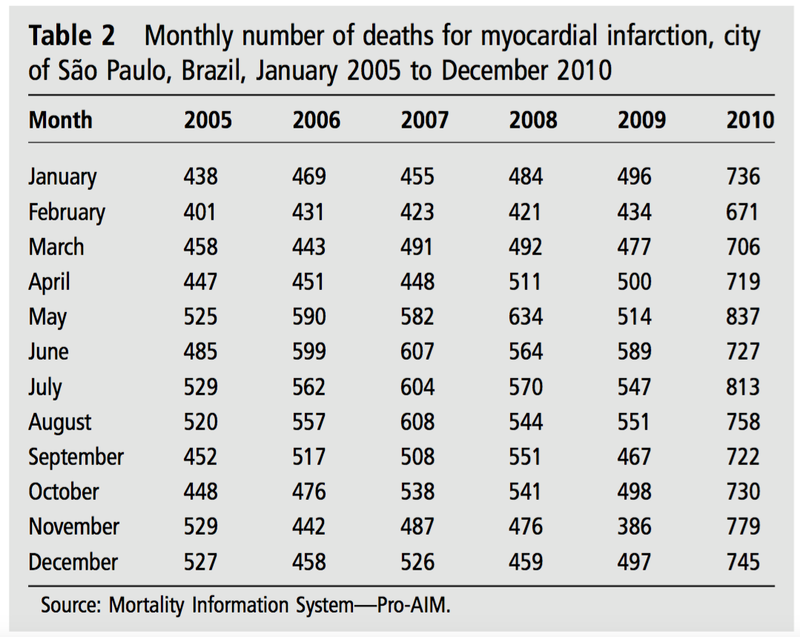 So they included all the stroke deaths alongside the heart attack deaths in 2010. A naive reader might expect this kind of thing to be picked up during peer review, but at Tobacco Control you'd be lucky if the reviewers notice a typo. This turns a startling rise into a more mundane continuation of the existing trend. If you can spot a 11.9% decline in the 17 months after the smoking ban then well done you. I can't. Nor do the figures for hospital admissions - which are correct, as far as we know - suggest that the smoking ban had any positive effect. The new figures for mortality mean the authors' claim is now deeply implausible rather than totally laughable. The neo-temperance movement wants to turn January into a secular Lent for hypochondriacs. Now, if you want to stop drinking for a month, that's up to you, but I strongly object to having my tax money spent on the Dry January project, particularly since Cancer Research UK runs an identical campaign without state-funding (the 'Dryathalon'). And I object further when the government uses my money to pay for the fund-raising activities of the soon-to-be-defunct pressure group Alcohol Concern. When Dry January was set up by Alcohol Concern in 2013, it was moderately successful and raised £38,000. Public Health England has since decided to throw our hard-earned money at it, giving Alcohol Concern £500,000 to spend on the 2015 event and £1,000,000 for last year. What has been the return on this 'investment'? Alcohol Concern are a little cagey about it, but their Justgiving page suggests that donations haven't risen since the first Dry January was launched on a shoestring. Last year's effort brought in just £33,000. Given the million pound investment, this is a net loss of £967,000. Dig deep, taxpayers! The source of the £1 million figure is this article from December 2015. Public Health England's accounts for January 2015 suggest that £1 million is in the right ballpark. More than 40,000 children and young people a year are having rotten teeth removed in hospital in further evidence of what doctors call the “costly scourge of sugar”. New NHS figures obtained by the Local Government Association (LGA) show that 40,800 under-18s in England had at least one tooth taken out last year under general anaesthetic because of decay. Performing the procedures cost £35.6m. The Local Government Association (LGA) says £35m was spent on extracting rotting teeth from under-18s in 2014-15, amounting to 40,970 procedures, compared with 32,457 in 2010-11. That was based on 2014/15's figure. Today's report was based on 2015/16's figure. 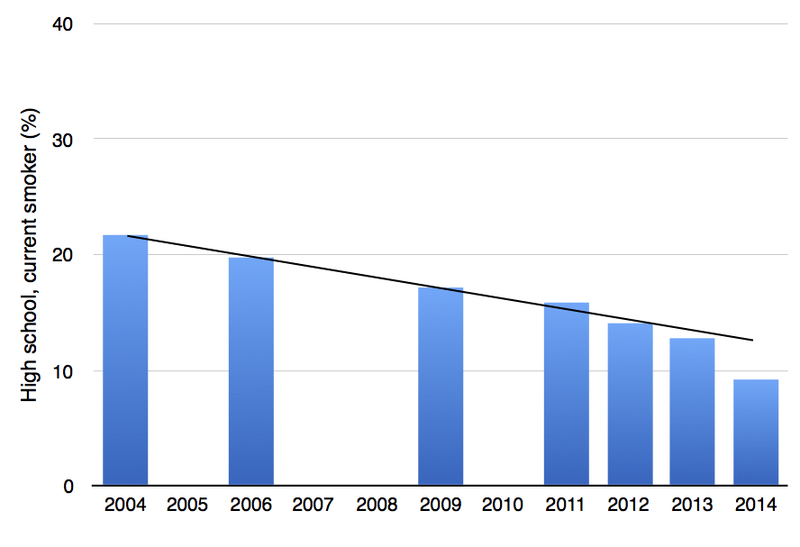 Note that the number of extractions has gone down (slightly) in the last year. The Guardian doesn't mention this, nor does it mention the fact that the government banned dentists from taking out more than one tooth in 2000 so all multiple extractions have to be taken out in hospital. 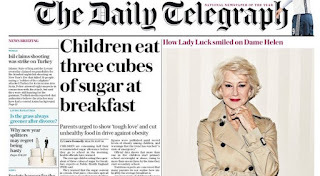 The publication of new figures is news of sorts, but it's hard to believe the Guardian would treat it as such if the LGA hadn't made it all about sugar. The LGA’s ‘community wellbeing spokeswoman’ says her figures prove that ‘we don’t just have a child obesity crisis, but a children’s oral health crisis too’. But do we? We are no longer a nation of Austin Powers. ‘The dental health of the majority of British children has improved dramatically since the early 1970s,’ according to a 2005 study, which also noted that ‘levels of dental decay in UK children at five and 12 years are among the lowest in the world.’ A further study in 2011 also found that ‘since the 1970s, the oral health of the population, both children’s dental decay experience and the decline [in] adult tooth loss, has improved steadily and substantially’. This was confirmed in a report from the Faculty of Dental Surgery last year. The rise in hospital admissions for childhood teeth extraction does not, therefore, reflect a general rise in childhood tooth decay. Quite the opposite. Nor does it reflect a rise in the consumption of sugar or sugary drinks (both have been falling). There has been no rise in childhood or adult tooth decay as a result of fizzy drinks or anything else. 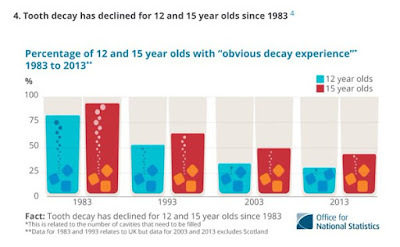 On the contrary, there has been a dramatic decline in tooth decay across all age groups. A couple of items to catalogue in the are-you-sure-this-ain't-a-spoof? file. Firstly, a wonderful new website called Secondhand Sugars™ (they are insistent about the trademark). Sugars can be harmful to children as early as in the womb. Secondhand Sugars™ are the sugars found in foods and beverages that babies in utero, infants, and children are exposed to involuntarily. The risks include obesity and related diseases like diabetes as well as cognitive and learning problems. Just as we protect children from dangerous secondhand smoke, we should prevent children from being exposed to secondhand sugars. For God's sake, don't tell them about lactose. You won't be surprised to hear that the founders of this important new piece of intellectual property hail from California. 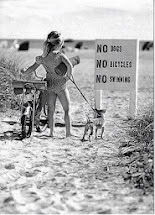 I don’t like the idea of regulation. If regulators feel the evidence is sufficient to go after my sugar, they might decide next week that [the evidence] exists to go after my pastrami. And I’m one of those people who happen to think pastrami is healthy. Sorry Gary, but that's just the way it goes. First e-cigarettes, now diet drinks. It's not the unhealthy part of the product that the puritans have a problem with, it's the existence of the product. I fully expect to see a crusade against non-alcoholic beer if anyone ever starts drinking it. The idea that zero-calorie products are a cause of obesity is absurd on its face and is unsupported by the evidence. It is not merely junk science, it is anti-science in that it implies that obesity is not caused by a surplus of energy but by some magical process involving bubbles and tin cans. It is front-page news because it is sensational, and it is sensational because it is not true. Children are packing in so much sugar at breakfast that half their daily allowance has already been eaten before school, Public Health England says. There is no such thing as a sugar allowance. Rationing was abolished in the early 1950s. What we have is a recommendation - a recommendation that was arbitrarily and unscientifically halved recently because - I suspect - people were getting close to meeting it. 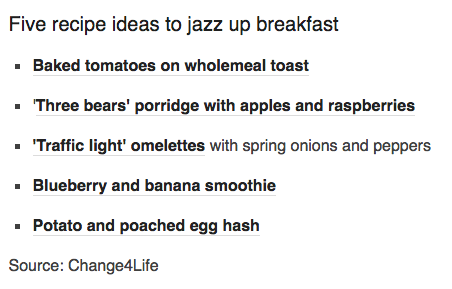 A survey of 200 parents with children aged four to 10 revealed the problem starts at breakfast. It found children were eating more than 11g of sugar or nearly three sugar cubes, on average, at breakfast alone. Eleven grams of sugar is nothing. It's 44 calories. 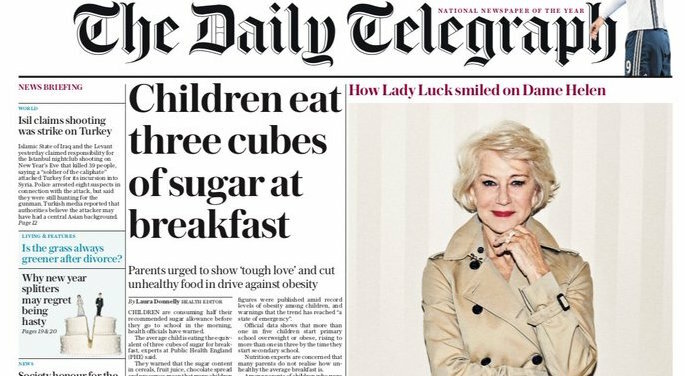 Britain is in a bad place if the consumption of 44 calories is front pages news. Public Health England could make themselves useful by waging an educational campaign against the hysteria and scientific illiteracy of the anti-sugar/low carb/high fat cultists. With a bit of effort, it might avert the epidemic of eating disorders that is on its way if the current irrationality persists. 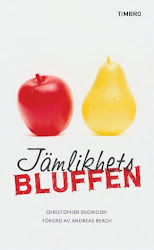 Instead, it is effectively collaborating with the Action on Sugar cranks in order to promote its Change4Life app. 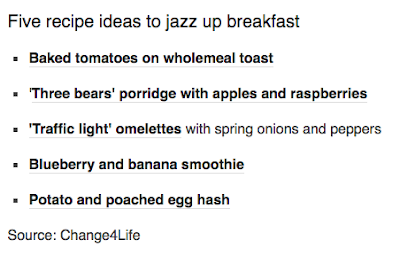 So let's look at the healthy breakfast alternatives suggested by Change4Life, five of which are given pride of place on Auntie Beeb's report of this non-story. Of the two sweet dishes suggested, the blueberry and banana smoothie contains 15 grams of sugar and a serving of the porridge contains 20 grams of sugar. Even the baked tomatoes have 9 grams of sugar. A touch of hypocrisy from Public Health England? Perhaps, but these dishes are not unhealthy. The amount of sugar in them is perfectly normal and appropriate. It would be very difficult to put together a palatable sweet dish for an adult or a child without 11 grams of sugar. For the most part, the parents are right. No child is going to come to harm by having 44 calories of sugar in their cereal bowl, on their toast or in their glass. Can everybody please get a grip?